Is it worth the cost in lives, heartbreak, loss? Can we really make a difference? I faced that question when I was injured. In fact, one paper ran a headline saying, has Marie Colvin gone too far this time? My answer then, and now, was that it is worth it. This year’s winner is a unique woman, a courageous war correspondent, who dedicated her life to reporting from the frontline of almost every major conflict in recent history. From the war in the Balkans to the armed conflict in Chechnya, to the wave of revolutions that ignited the Arab Spring – Marie Colvin was there, bearing witness and giving a voice to those caught up in the heart of the ‘sandstorm’. She exposed the horrors of war and made a difference. We honour Marie Colvin for her courage, integrity and passion for truth. She lived a life of courage and truth-telling in the face of grave danger, just as Anna did, and paid for it with her life. 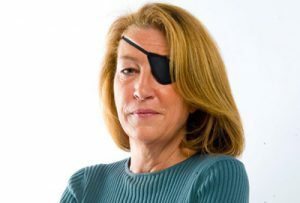 One of the most experienced and noted war correspondents of her generation Marie Colvin lost her life on 22 February 2012 while reporting from the besieged city of Homs, in Western Syria. She had defied the ban on foreign journalists imposed by the Syrian government and entered the country on the back of a motorcycle – ensuring the world would hear about the atrocities against civilians that continue there to this day; hoping that the world would care. In the face of grave danger, she stayed in Homs where some of the most brutal violence occurred. Marie, like the 2011 Anna Politkovskaya Award winner Razan Zaitouneh (from Syria) before her, became a voice for the Syrian people, who continue their struggle for freedom and human rights. “It’s a complete and utter lie that they are only going after terrorists… the Syrian army is simply shelling a city of cold, starving civilians”. The following day, she was killed, while escaping from a makeshift media centre in a civilian building, which was being shelled by the Syrian government army. We celebrate Marie Colvin, who like Anna, carried on working, in the face of great personal danger, seeing it to be her professional duty to bear witness and give a voice to those trapped by the violence of war and conflict. Marie Colvin’s career as a journalist spanned over 30 years. After graduating from Yale, Marie started her career as a police reporter for United Press International (UPI), she moved to Paris to work for UPI there, before joining the British newspaper The Sunday Times in 1985 where she remained until her death. Originally the Sunday Time’s Middle East correspondent, and later Foreign Correspondent, Marie Colvin covered conflicts in Sierra Leone, Zimbabwe, Chechnya, Kosovo, Sri Lanka and East Timor. It was during her time in East Timor that she was credited with saving the lives of 1,500 women and children after she refused to leave them in a compound besieged by Indonesian-backed forces. Marie lost the use of her left eye after getting caught in a grenade blast, while reporting on the Sri Lankan civil war in 2001. In early 2011, she covered the Arab Spring’s uprisings across Tunisia, Egypt and Libya and was the first journalist offered an interview access to Muammar Gaddafi after conflict broke out in Libya. Marie Colvin: winner of the 2012 Anna Politkovskaya Award. Veteran Sunday Times war correspondent, Marie Colvin was killed in February 2012 when covering the uprising in Syria. Winner of the Orwell Special Prize ‘On the Front Line’ is a collection of her finest work, a portion of the proceeds from which will go to the Marie Colvin Memorial Fund… Marie Colvin held a profound belief in the pursuit of truth, and the courage and humanity of her work was deeply admired. On the Front Line includes her various interviews with Yasser Arafat and Colonel Gadaffi; reports from East Timor in 1999 where she shamed the UN into protecting its refugees; accounts of her terrifying escape from the Russian army in Chechnya; and reports from the strongholds of the Sri Lankan Tamil Tigers where she was hit by shrapnel, leaving her blind in one eye. Typically, however, her new eye-patch only reinforced Colvin’s sense of humour and selfless conviction. She returned quickly to the front line, reporting on 9/11, Afghanistan, Iraq, Gaza and, lately, the Arab Spring. I feel the irony of fate. Firstly, because I am writing to you again, Anna Politkovskaya, following a year, which passed like a century while we still run between dream and death. Secondly, because I have been commissioned to present the award in your name to another woman who left us while trying to convey the truth that cost her life. Marie Colvin, the courageous reporter, never feared searching for truth in the face of death. Marie went to many countries wracked by wars and conflict to bear witness. She lost her eye while covering the civil war in Sri Lanka. In Syria, Marie chose the capital of the revolution, Homs, to report, both in sound and through images, an aspect of the revolution that the regime turned into an all-out war against the Syrians. Marie was not wrong in her choice. At that time, Homs was the whole event, the focus of most journalists, the symbol of the revolution, and the symbol of survival despite voracious death. Right up to the last, Marie Colvin was sending reports that show the ugly crimes committed against the city and its people. Within a few seconds, she became the headline and content of the news. About seventy foreign reporters and local citizen-journalists died during the months of the revolution. The regime’s shells and tanks do not differentiate between one who holds the camera and the pen, the demonstrator who holds banners, or the child who holds his future in his small hands. Everyone, without exception, is a target of a destructive, insatiable machine. It does not distinguish between Syrians and non-Syrians, as long as they have the vocabulary of freedom and truth in their dictionary: Marie Colvin, Rémi Ochlik, Mazhar Tayyara, Basil Shehadeh, Rami al-Sayed, Anas Tersheh, Mika Yamamoto, Hassan Azhari and dozens of others. We often followed their reports and videos and spread their news, without paying attention to those behind the camera, handset or computer screen. It was only later that we realized they were always in the grip of death. It is said that the shoes of Marie Colvin led to her death. She removed them upon entering the hall of the building that was used as a revolutionary media center in the area. When the shelling began, Marie rushed to retrieve her shoes in order to flee with the others, but the shell did not wait. She and her colleague, Rémi, and others were killed. It seems a shameful, humiliating fact, yet also demonstrates, Anna, the reality of a country where practicing any form of life, with the daily, trivial minutiae that make us ordinary human beings, has become impossible. The number of martyrs is over thirty thousand, including about 2,650 children and more than 1,700 women. We are working hard to collect their photos and curiously intervene in the details of their lost lives, desperately trying to keep mementos of their existence. This is a fraction of our duty toward them, but is also an important part of resisting death, carried out by us, the living. There is not a stone left unturned in my country - the government army’s relentless destruction has made sure of that. Normally, we hear the roar of a plane, and after a few seconds, we hear the sound of shelling. We wait a little bit to start counting the martyrs and watch a video showing that what was once a building with floors, apartments, furniture, child beds, family pictures and toys has become a pile of dust and stones. Ancient neighborhoods and markets, that store our memories and are part of our history, and lanes, a womb of our memories, were burned to the ground and our hearts burned with them. Maybe I do not have the right to complain, Anna. You paid with your life for what you believed in. Marie, who we honor today in your name, paid the same price. As did your friend and the first recipient of the award, Natalia Estemirova, in Chechnya. However, I just cannot fathom the dull stupidity of the world, of governments and regimes east and west! I feel there is no difference between your government, which was responsible for your death, Anna, through shameful standing with a criminal and murderous regime, and the governments that condemned your killing, as they have condemned the killing of thousands of my people. They do not find an "incentive", a sufficient interest, to defend human lives by more than a few trite words. Words are yours alone, Anna, you and Marie Colvin, Rami al-Sayed, Jel Jakiye, Abdul Aziz al-Sheikh, Mohammed Badie al-Kasem, and all the others who gave a new meaning to words and images, with a lot of love and determination. Finally, let me, in your name, Anna Politkovskaya, honor your courageous colleague, Marie Colvin. I would like also to honor everyone carrying the obsession of freedom and truth in their heart; in Syria, which is tired and sad but determined to realize freedom; in occupied Palestine; in Chechnya; in Darfur; in Afghanistan; in the countries of the Arab Spring; in states where people do not have a chance of resurrection; in Iran, where the people aspire to be liberated from tyranny; and in every corner of this world, where people are still suffering to live in freedom and dignity." The Sunday Times, 19 February 2012, Final dispatch from Homs, the battered city - Marie Colvin was the only British journalist reporting from inside the besieged Syrian enclave of Baba Amr. This is her final written report. More tributes and information about Marie can be found at the website set up in her name - www.mariecolvin.org.